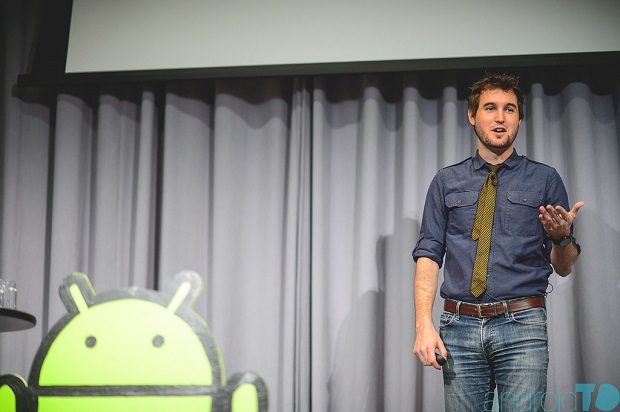 AndroidTO. Oct. 30, 2014. (Image: Brian De Rivera Simon, for Tarsipix Studios). For Kevin Grant, app design is a balancing act between following the rules at times – and at others, breaking them in the name of experimentation. Grant, who works in Tumblr in New York, has been part of the company’s five-person Android team since February 2013. And along the way, he’s learned a few things about how developers should be designing their apps for their users. Kevin Grant of Tumblr, speaking at AndroidTO. Oct. 30, 2014. (Image: Brian De Rivera Simon, for Tarsipix Studios). “If something is valuable to your product, this is to say that whatever you’re building – this feature that you’re making – does it make sense? Does it fit in with what you’re actually supposed to be doing?” said Grant, speaking from AndroidTO, a developers’ conference held in Toronto on Thursday. A lot of developers often think design should be relegated to the role of the graphic designer, Grant said. But he added developers don’t have to be artists, nor does design have to be strictly limited to graphics, interaction, and so on. After all, developers should ensure users enjoy their apps, and that they get some benefit from them – and that’s one key principle of the material design framework. That framework tells developers what to keep in mind as they develop their apps, with its core tenets chosen to serve end users. For example, one piece of the framework says that developers should build apps that display tangible surfaces within an app – like an app that mimics the look and texture of paper. Then there’s the idea of meaningful motion, which means developers only add app animations where it makes sense. For example, a wiggling arrow should only wiggle to show a user that it can be tapped to kickstart a specific action. And then there is the need to create apps that use bold colours and bold design, for eyecatching, appealing apps that users would enjoy using. In Grant’s eyes, one of the cardinal sins of app design is creating choppy transitions between screens. For an app to veer from one screen to another, with no warning, is jarring and unattractive, he said. Still, that doesn’t mean developers should avoid experimenting, in the name of sticking to the material design framework. While the principles of the framework are pretty useful, there’s also some need for creativity, Grant said. He pointed to all of the new things developers can do with Android 5.0, or Android Lollipop, Google’s latest iteration of its mobile operating system. For example, creating screen transitions is now a lot easier, and it requires fewer lines of code than it did in previous versions of Android. So now, developers who want to make beautiful apps can definitely do it, through adding small, but noticeable features like transitions, animations, and accents like floating action buttons. Apps like Swarm by Foursquare, as well as Pocketcast, are doing a great job of this, Grant said. Grant concedes that ensuring apps are the best they can be will definitely take time. At Tumblr, he and his team spent a lot of time ensuring videos would autoplay as users scrolled down their dashboards. And one of his coworkers spent about a month working on the animation that comes with composing new posts for the platform. But putting in the extra effort is worth it, he said. “There are probably a zillion apps in the Play Store, and every single one is designed slightly differently … It’s your responsibility as developers of your applications to use as many of these apps as possible,” he said, adding his SD card is maxed out with app downloads.